Ralph Macchio is not the “Karate Kid.” He is a Senior Editor at Marvel Comics who oversaw Frank Miller’s run on “Daredevil” and Walter Simonson’s run on “Thor.” In addition to these acclaimed runs, Ralph edited the wildly successful “Ultimate” line, which re-launched Marvel’s greatest heroes for modern times, and Stephen King’s “Dark Tower” comics. Today, Ralph has returned to an old friend, who happens to be Marvel’s next movie star, Thor. 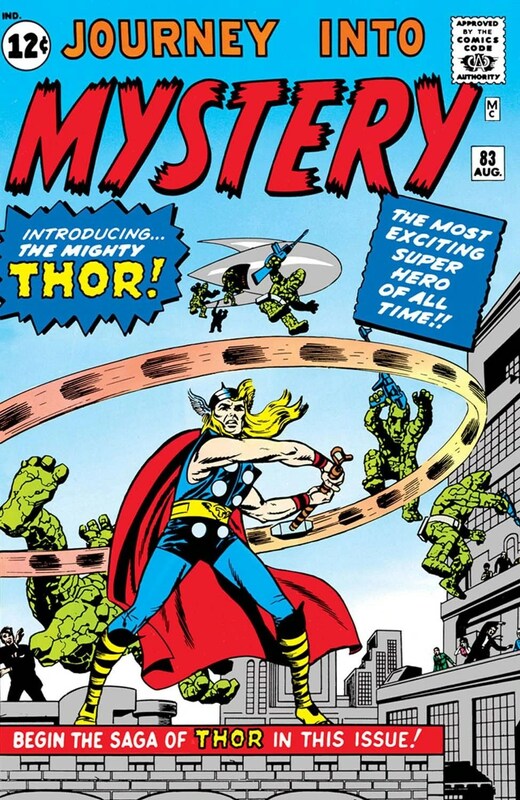 Ralph is editing the upcoming “Mighty Thor” book and “Journey into Mystery.” With the impending release of the movie, I talked with Ralph about Thor, why he’s important, why you should see the movie, why you should be reading Thor, and what it’s like to return to Thor after such a lengthy absence. 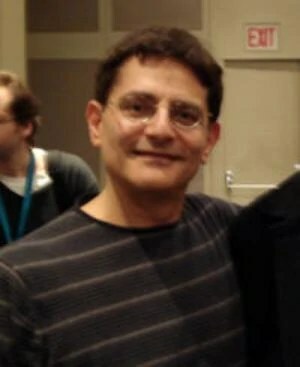 Ralph Macchio. Marvel Senior Editor and master of the Crane Kick. What’s it like to return to Thor after all these years? Considering that he has gone through an entire “Ragnarok” cycle, faded out of existence and come back, it’s like coming back to a brand new character. The status quo has changed from when I was last on the book. A lot of things are very different, even the way the Asgardians talk is a little different. (Thor used to speak in Shakespearian) Loki [at one point] came back as a woman. Sif is back in a very different form. Odin was kind of dead and gone for a while. A lot of things have happened in the strip. If you think about it, it is probably one of the most radically altered books Marvel’s ever done because we virtually (at one point) wiped out the entire cast, said goodbye to the book for awhile, brought it back, found a whole new and fantastic creative team who did their thing for awhile before moving on, and then I jumped back on. It’s not like returning to the same book: Thor’s costume is different. A lot of the costumes are different. It’s a very different thing, but because I’ve always loved the Thor mythology and I’ve always loved the Asgardian mythology with the gods, it’s always a good book to come back to so I’m as excited working on it now as I was the first time. Art by the late, great, Michael Turner. For a mainstream audience what is Thor’s appeal? For a mainstream audience, I think it’s the lure of adventure. It’s the same reason a mainstream audience would be turned on by “Ben Hur” or any other huge costume drama. You are seeing larger-than-life figures through a human perspective: having the kinds of emotions and feelings that we have, only on a much larger and grander scale. When you think about some of the greatest works of literature, like “The Iliad” and “The Odyssey,” they dealt with the gods. When you read the Greek plays, many of them deal with the gods. Yet at the same time, these are gods who reflect the emotions of the people that brought them into being. In the Greek myths Zeus was angry, Zeus could be sullen, Zeus could mess around with eight million goddesses and cheat on his wife-the same things that men did. Likewise, the female goddesses reflected women’s attitudes of the day and their perspective on things. Even though the gods were gigantic figures that had immense physical powers, they still had the same foibles, fallacies, great loves, and hatreds that the men and women of the day who read or heard about their exploits. So, that’s what I think a mainstream audience feels about these characters. They’re all really gigantic reflections of themselves. Did you read the script or do any consultation on the movie? Yes. I did get a chance to read the script. I was actually on the set and was very graciously offered a small part in the movie. Yes. I am in a small scene near the end of the movie. Volstagg is at a banquet table regaling people with his normal gigantic flourish. I am at that table. It’s a wonderful thing. It was incredible to watch Kenneth Branagh direct Anthony Hopkins (Odin). To have been there, behind the scenes, and to see these two gigantic figures work with one another. And, of course, to see people like Chris Hemsworth just fall so naturally into the role of Thor, to both look the character and be able to behave as this character. I was really taken with the entire experience. It was one of the finest weeks that I have spent in many a year. The shoot had gone on more than a year when I was out there. They weren’t even halfway done; they still had a lot of exteriors to shoot. There was green screen everywhere so there were a lot of special effects to be done. I’m sure even now, with the rough cut being done, they may still go back and make some changes. So, to me, up until the moment the premiere is shown, it’s almost like a never-ending process. But, I know that from the conception to the ending, I’m sure it was something that was literally a couple of years in the making. How long was the shoot for your scene? I was there for a week. Most of the time was spent sitting behind the scenes and watching the interaction between Kenneth Branagh, his cast, and the screenwriter. My scene took an entire day to shoot even though it probably wouldn’t occupy more than five or ten seconds on screen. This banquet scene gets done again and again and again because he (Branagh) wants it a certain way. He wants the camera to see it from a different angle, he wants to get the reaction, and he wants Volstagg to repeat his lines with a different inflection and hear different reactions from the other people at the banquet table. You do get a real sense of how difficult it is to make a movie because you can’t really tell how a scene is going to come out when you’re doing it. I don’t know what that scene is going to look like and I was in it! I know the cast is working with a brilliant director so my sense is it’s going to come out absolutely perfect, but I don’t really know. That’s why I say it’s such a difficult thing to make a movie because even for a small scene like that, we were there for a whole day shooting it again and again and again. It was incredible. Does the movie capture the spirit of the characters? How would you describe the tone of the movie from what you read in the script? I would say that it absolutely captures the essence of Thor, the mythic figure. The humility he needed to learn, the arrogance he begins with, I think they are perfectly captured in the film. You’ll have to wait and see it so you can judge for yourself, and there’s very little that I may say about the movie. I believe everybody from Kenneth Branagh on down got the idea of Thor. They knew what this thing was all about and put all of that spirit into the film itself. I’m absolutely confident that they carried it across. We’ll see if the audience feels that way. I certainly feel that way. In the past, Thor has been considered a hard sell. Why do you think that was? I think almost any character that has been around for as long as he has goes through ups and downs. Most of the mainstream Marvel characters have been published almost consistently for over forty years. This character first appeared in 1962 in “Journey into Mystery.” I don’t even want to count how many years ago that was. Since that time he’s appeared in his own comic on a monthly basis all the way through, with a small period of time here and there where he wasn’t published. I think after awhile maybe you need to retrench and the creators need to sort of rethink things. If you think about how many people have tried their hand at Thor and given him their own interpretation at a certain point you say, “Okay, maybe we’re played out a little bit.” But Thor is such a rich character, and Asgard is such an incredible landscape peopled with so many fascinating characters that you are always going to come back to it. When you think of how many things have been done in that strip over forty- something years, it’s absolutely amazing. You think about television shows or movie franchises, how many from that period of the sixties are still with us? Maybe James Bond? But we still have Thor. So, I don’t think there was anything wrong with the character, I just think that at a certain point it’s good to sort of retrench. Marvel did “Ragnarok” and that seemed to be a logical breaking point to rethink things and figure out how to bring Thor back. So, I think it was good on all fronts, really, that it ceased publication for a short period of time. 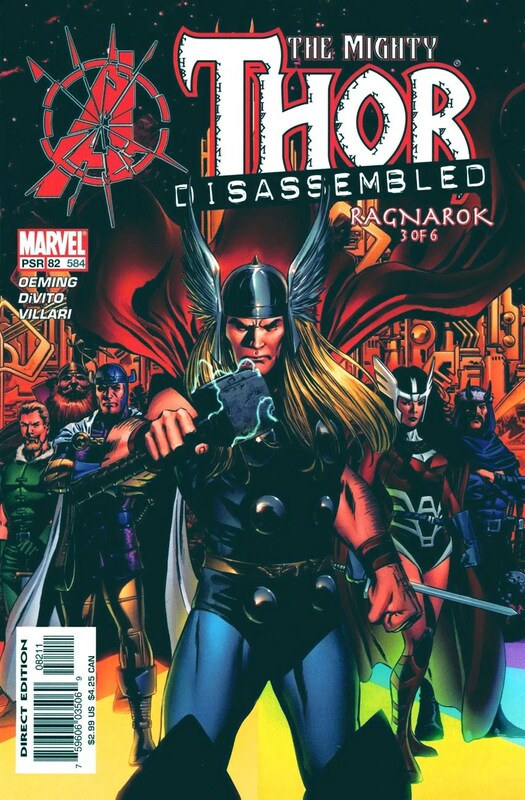 Do you think the three-year hiatus between “Ragnarok” and the J. Michael Straczynski (Babylon 5 creator and Real Ghostbusters writer) run whetted people’s appetites for Thor? Sure. You know the old saying, “absence makes the heart grow fonder.” If you really wanted to you could’ve put the period on Thor after “Ragnarok.” But, I think a character like Thor just demands to come back. As long as you’ve got the Marvel Universe and as long as people tell those stories (and those legends about Thor go back a lot further then 1962), people want to know what’s going on with these gods. The comic book audience will certainly be clamoring for more Thor. I think the fact that the book has returned and been a consistently good seller is something very, very interesting. He’s back and he’s bigger then ever. It’s amazing how much things have changed at Marvel. At one point “Spider-Man”,” X-Men”, the “Ultimate” line, and “Marvel Knights” were the big sellers now the “Marvel Hero (Avengers)” line has taken over and usurped X-Men, which it seems has moved down. I wouldn’t say that any group has moved down. As time goes by, certain groups and certain characters have their ups and downs. But if you look at the “Spider-Man” franchise and the “X-Men” franchise, they’re all doing terrifically. And if you look at the sales figures, a lot of the top ten books are still X-Men books. What you do have is an emphasis on the “Avengers” franchise, and books connected to it are doing better now than they have in the past. “Captain America”, for example, was always kind of a mid-range seller and now Cap is right up there at the top. The brilliance of Ed Brubaker, the connection with the Avengers, the “Death of Cap,” and “Return of Cap” really put a spotlight on him. I don’t believe the Avengers have usurped the X-Men. I think the X-Men have remained very popular and I think the Avengers are moving alongside them, but I don’t think there’s been a diminishing of status for the X-Men. You put the X-Men in a comic and you’re still doing pretty well. That’s right. Think about that. Thor leads the Asgardians into their final battle during "Ragnarok." Art by Andrea DiVito. One of the biggest differences in “Post-Ragnarok” was that when Thor came back, a lot of the gods were found to be civilians. Were there ever plans to give the gods civilian identities like Thor? Not that I was aware of. It may have been in Straczynski’s mind. We do have Don Blake back again, of course, and that’s an interesting return. As far as I know there wasn’t ever a thought to take the Asgardians and permanently give them human identities. So, no, I don’t think so. Do you think that’d be an interesting direction? I’ll tell you why I’m not that wild about it: One of the unique features of Thor is that due to his birth through the Earth goddess, Gaia, he has a unique connection with Earth. 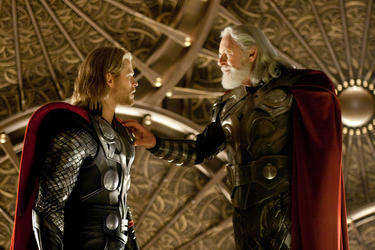 To me, the other Asgardians see Earth and want to keep it at arms length. They don’t mind coming down here every once in a while but I think they look at it and say, “Look at them all scurrying around down there.” They’ve got Asgard. What separates Thor from the other gods, even Odin, is that he has this love of Earth and this duality about him: that he’s both the god and the mortal and the mortal and the god. I think if you were to give that affinity to all the Asgardians, it would diminish Thor’s uniqueness. Since this is Thor’s book, I think it’s important that he have that unique connection to Earth and that it not be something we bestow to all Asgardians. "Mighty Thor" pits Thor against Galactus and the Silver Surfer. On sale 4/27/11. Art by Olivier Coipel. Why are you launching a new “Thor” book? Right now? Because of the movie and because of the creative talent on Thor, we feel that there is enough Thor material to go around. When we discussed the plans for what we wanted to do, we realized we could have one of the Thor books, “Journey into Mystery” focus on Loki in his new “Kid Loki” form. 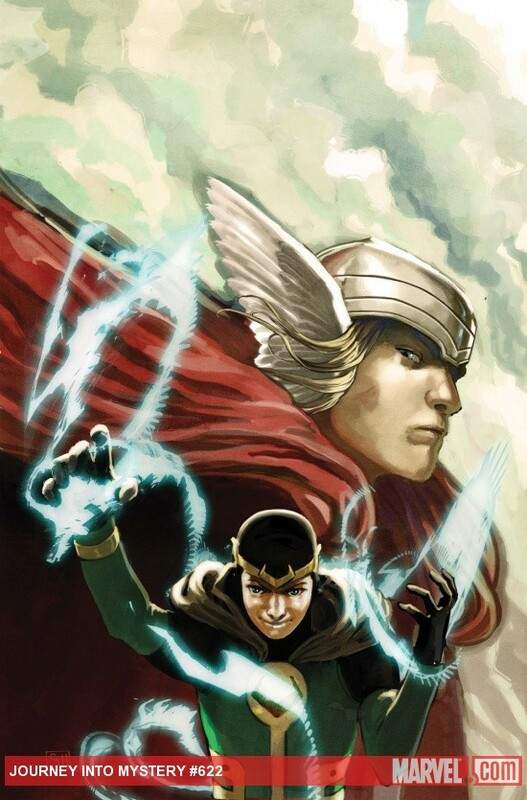 It’s going to be fascinating to see what Kieron Gillen does as he moves along with Loki. The first issue, tied into “Fear Itself”, will make a fascinating read. You have “Mighty Thor,” which is Matt Fraction and Olivier Coipel, and you’re going to have all the big cosmic Thor stuff you could ask for. You’re going to have the return of “Journey into Mystery,” which keeps the numbering sequence from “Thor” as if the book never ended. The cast of Thor is certainly vast enough and the ideas are certainly interesting enough that with the popularity of Thor right now it can support two, maybe even three books. We also have “Astonishing Thor” running right now. The template on that is sort of a stand-alone Thor adventure with Thor contending with Ego, the Stranger, and the Collector. That’s a story that really does not impact the rest of the Thor universe. There’s just so much in Thor that if you give each book it’s own identity, I think you can easily support two, maybe three books, and that’s largely the reason why we felt we could do something like this. I agree, but I really don’t want to say anything because the first issue is just coming out and you’ve got a nice six-issue arc to begin with. That whole arc is going to be huge so I don’t want to say anything about plans beyond that because for the next six months you’re going to be entertained by Thor, Galactus, and the Silver Surfer. I don’t want to say “beyond that we’ve got this, this, and this” but as time goes by, you will see gigantic things begin to unfold. The cover to Journey Into Mystery # 622 by Stephanie Hans. On sale now. “Fear Itself” has launched, featuring both of Marvel’s movie stars Thor and Captain America having to battle Red Skull’s daughter, Sin, who has taken the form of Skadi. In a broad sense, how will this story affect Cap and Thor going forward? Do you think Skadi might stick around after “Fear Itself”? I have no idea. I honestly don’t. Beta Ray Bill. Art by Walter Simonson. Here’s a fun activity. We all know Don Blake isn’t the only person worthy to hold the hammer of Thor. An alien named Beta Ray Bill was deemed worthy. Even Superman wielded it for a period of time (in JLA/Avengers). Here’s a list of names from the Marvel Universe and I want to know your thoughts on whether or not they’d be worthy of holding the hammer of Thor. Let’s start with Peter Parker? I think that Peter has shown himself to be a man of great ethical courage. I would say: Sure. <Laughs> you know, that one’s a tough one. I think that as you’ve seen recently in “Spider-Man,” Flash is certainly doing what he needs to do. He’s fought for his country and has been a good soldier. While he may have picked on Peter Parker in high school, right now he’s probably worthy of holding that hammer. <Laughs> Irving makes his own hammer. He doesn’t care about Thor’s hammer; he’s got his own. The Frog of Thunder. Yes, you read that right. One of Walter Simonsons most memorable stories. A cover from Walter Simonsons legendary run. Going back to the beginning and Walt Simonson’s legendary run, what do you see is the biggest difference between Simonson and Matt Fraction as creators? And are you getting the same feeling about Fraction’s run as you did with Simonson’s? Yes. Obviously the biggest difference is that Walt drew a lot of his run and Matt is not drawing his run. But, they both approach it in an interesting way. Both revere the Lee and Kirby material and realize that the Marvel Thor is not exactly the mythological figure. At the same time they both have a real desire to pull in the Norse mythology really closely and to connect it, in a very strong way, to the Lee and Kirby mythology. When I was growing up, I thought that what Lee and Kirby were doing was the gospel. I didn’t realize until later that they were playing fast and loose with the legends in certain instances. I think, much to the betterment of the book, it’s a fascinating idea that they didn’t really create Thor but they created a super hero called Thor, based on a mythological figure. That’s really a startling and stunning idea. Walt always had interest in Norse mythology and he brought that to bear on his run. The same thing with Matt, and Matt I know also was a huge fan of Walt’s run, too. So, I do get the same feeling they both have a great sense of the epic scope and scale that is at the heart of Thor. They both have commented that in Marvel, you don’t get much bigger than Thor. You can do just about any type of story. There is no limit on where you can go with this character, be it through time, through dimensions, or the furthest reaches of space. They really both have that epic feel and I think that certainly shows in both of their runs. And again, remember, Matt in many ways is just beginning his. Will Natalie Portmans Jane Foster steal the title of Marvels leading lady from Gwyneth Paltrows Pepper Potts? Do you think Natalie Portman has what takes to be Gwyneth Paltrow’s equal in the sidekick department? <Laughs> Yes. Definitely. She’s a marvelous actress and she brings an incredible amount of craft to the role. Absolutely yes. Thor # 137. Ralphs Favorite Thor Story. Art by Jack Kirby. Finally, your favorite Thor story? 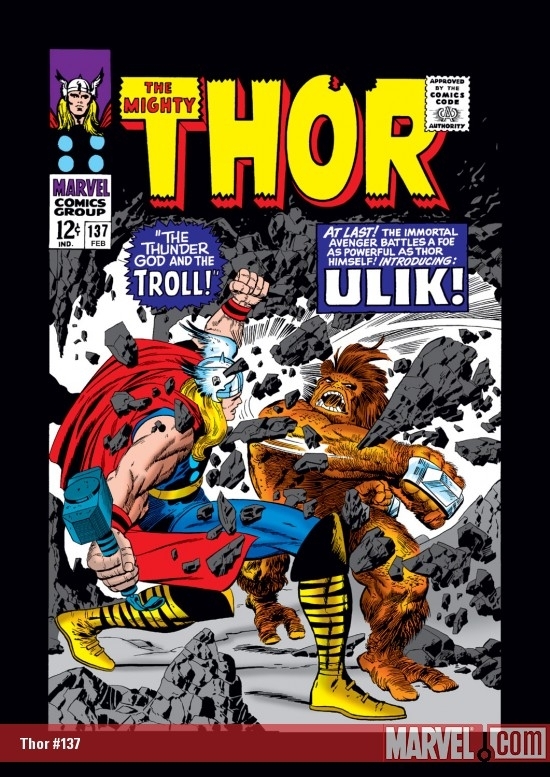 I would have to say, and it’s probably because at the time I was so into Thor, the quintessential Thor story that did everything for me was the original story by Lee and Kirby that introduced Ulik, the troll. It was Kirby and Stan at their peak in my opinion. There was a war between the troll empire and the Asgardian Empire that was illustrated as only Kirby could do it. You had this one character that could actually go toe to toe with Thor (and he’s got some toes) in Ulik. And then there was this otherworldly figure, Orikal. Orikal was Stan’s twist on the name oracle. I didn’t realize that for many, many years. The visuals, the sense of scale, the war between the two empires, the Orikal figure, everything about it just hit me. I wanted to live there. I wanted to live in Asgard. I wanted to be with those guys and I wanted to be in that adventure. You can’t ask for more than that. The entire Lee/Kirby run was fabulous as you watched them get bigger and bigger and bigger. For me that was the one story that encapsulated everything I wanted to see in a Thor comic. Issue 137. A big thank you to Ralph Macchio for taking the time to speak with me. Thor hits movie theaters on May 6th. Can’t wait? Check out Thor Month on Marvel.com for all sorts of Thor related goodness.